This was a delicious dish prepared by my friend Howard, for our Chilean wine & dine event. He always prepared some great recipes and this one is no exception! Adapted from How to Cook Meat by Chris Schlesinger and John Willoughby. 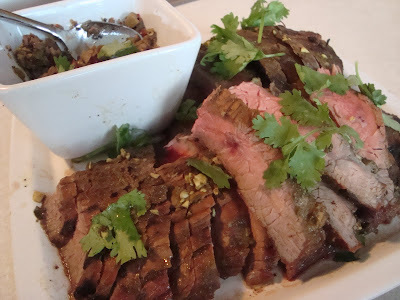 Flank or round steak can be used instead of the skirt steak. Southwest, Mexican, South American(Chilean) recipe. Place the steak in a shallow dish and pour the lime juice over it. Cover the dish and let it stand in the refrigerator for 30 minutes to 1 hour, turning occasionally. Light up a fire in your grill. In a small bowl, combine all the rub ingredients and mix well. Remove the steak from the marinade, pat dry with paper towels, and rub it all over with the spice rub, pressing gently to be sure it sticks. When the fire has died down and the coals are hot (you can hold your hand 5 inches from the grill surface for 1 to 2 seconds), place the steak on the grill and cook until well-seared on one side, about 4 minutes. Turn and continue to cook to the desired doneness, about 4 minutes more for rare. To check for doneness: Make a 1/4-inch cut in the thickest part of the meat and take a peek; it should be slightly less done than you like it. Remove the steak from the heat, cover it loosely with foil, and allow it to rest for 5 minutes while you make the relish. In a medium bowl, combine all the relish ingredients and mix well. Slice the steak as thin as possible against the grain and serve with the relish. Enjoy! Note* You may substitute flank steak, or round steak for the skirt. OMG..It looks super yummy. Wine will do better with it. Keep it up the good work.